But one way or the other my local Albertson's has a huge bin of these. I had never heard of them but some Googling found me that Candy Addict had reviewed them waaay back in 2006! (read that review HERE). Once I worked past the smell and actually got to a piece of candy I was pleased to find that the strawberry flavor was actually much more stubtle then the overwelming aroma would have you expect. While it is an improvement from what I was expecting (I guess) it still tasted like a heart shaped, strawberry scented, Zac Efron shrine candle that melted into a random batch of Hershey's chocolate. Oh and BTW the aftertaste is from hell. 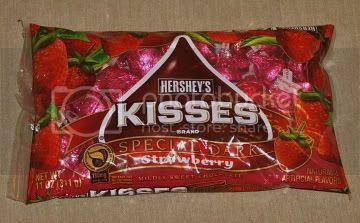 I normally like Hershey's Special dark chocolate but I just couldn't enjoy it with the strawberry. If you missed these kisses the first time around consider yourself lucky. If you see that big old bin at the store that I told you about- well my friends there is a reason they are in a big old bin! "tasted like a heart shaped, strawberry scented, Zac Efron shrine candle that melted into a random batch of Hershey's chocolate"
Sprite out the nose stings. That is an awesome description.